What’s that you say? You’ve been waiting your whole life for someone to make a gorgeously-rendered historical fiction game about the criminal underworld of New York City in the 1930s? What a coincidence! That’s exactly what we’ve been working on here at Molly Rocket. 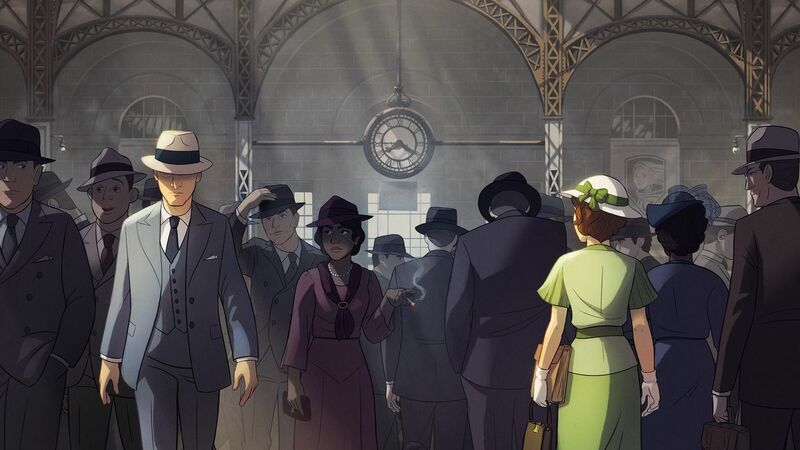 Our new game, 1935, takes you back in time to New York City at the height of The Great Depression, and invites you to take part in one of the most storied years in the history of the mafia in America. Is it a crime drama? Is it a love story? Is it about betrayal, friendship, family, business, politics? We’d love to tell you, but we quite literally can’t, because we don’t decide which of those things the story is about — you do. 1935 is the first game of its kind. As I’ve written about extensively on this blog, our primary focus at Molly Rocket is on developing new technology for creating unprecedentedly interactive stories. 1935 is the first game to use this technology, and we can promise you it will be the most interactive story you’ve ever played. Like a “walking simulator” or “visual novel”, the plot and characters take center stage, but unlike those genres, 1935 integrates real, deeply interactive gameplay for the very first time. Gone are the canned story moments and ineffectual dialog trees that make you feel like you’re just “clicking through” a prewritten story with a few branches at best. Instead, 1935 is built on a completely new dynamic story engine designed to put you in control of the main character like never before. So when we say that the story is as much up to you as it is to us, we really mean it. You are in control of the main character, and every single thing you choose to do has an effect on the events that unfold over the year 1935. Organized crime in New York City in the 1930s is quite a bit different than you might be imagining. Thanks to the dominant popular fiction (The Godfather, Goodfellas, etc. ), the conventional wisdom holds that New York City’s organized crime was the exclusive business of Italian immigrants and their descendents. That’s not too bad of an approximation if you’re talking about post-1930s organized crime. But during the 1930s and earlier, the picture was more complex. We’ll take a more detailed look at the motivating factors of New York’s political, structural, and racial tensions in future blog posts, but suffice it to say, an accurate depiction of 1930s organized crime is as much a story of what happened in New York’s Jewish and Black communities as it was about Sicilian-Americans. We really wanted to get the history right, and present as accurate a portrayal of the period as we could, so if our game comes across as not your typical mob story, that’s not because we’re trying to create some kind of alternate history. Quite the contrary! In fact, most of the characters in the game are real people from the historical record. In the poster at the top of this post, except for the two highlighted figures, everyone in the foreground is a real person who actually existed and played an important role in the pivotal events of 1935’s many power struggles. And that’s just a small sampling. The game itself features over twenty primary characters, most of whom are real people portrayed in their period-accurate roles. Obviously, since it’s a highly interactive game, and since nobody kept explicit records of what actually got said in their day-to-day meetings and interactions, the characterizations and dialogue are inevitably fictional. As you might expect, since this is the first time we’ve even publicly stated the name of the game we’re working on, it’s still quite early in our development cycle. So we don’t have too much more to say at the moment. But over the next few months we’ll be posting screenshots, trailers, history discussions, and of course our eventual ship date right here on this blog. If you’d like to be kept up to date on all that, please do sign up for our mailing list below! It only sends out the contents of these posts each Monday and nothing else, ever. That’s all for now. Thanks for reading, and we’ll see you next week!